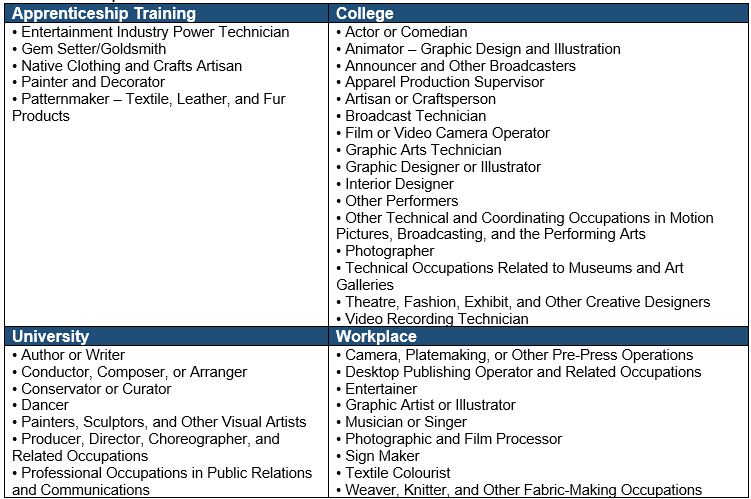 The SHSM–Arts and Culture enables students to build a foundation of sector-focused knowledge and skills before graduating and entering apprenticeship training, college, university, or an entry-level position in the workplace. Depending on local circumstances, this SHSM may be designed to have a particular focus – for example, on dance, dramatic arts management, or technical production. According to the Canada Council for the Arts, arts and culture are essential elements in the new global economy – not only for their entertainment value but also for the skills they develop in individuals. Participating in an Arts & Culture SHSM will provide students with an opportunity to start developing the skills necessary for a future career in the Arts. During the 1990s, the arts & culture sector labour force grew by 31%, compared to a growth rate of 20% for Canada's labour force as a whole.